Mercedes has unveiled the new generation of its smallest model, the A class. Since the car's 1997 launch, Mercedes has sold more than 5.5 million A and B class models globally. FRANKFURT -- As German premium brands brace themselves for the potentially treacherous transition to autonomous, electric and shared vehicles, Audi, BMW and Mercedes-Benz should enjoy the advantage of starting from a position of strength. Buoyant Chinese demand and a continued push into trendy niches with lifestyle-oriented products such as the upcoming BMW X2 crossover should help propel the trio to further growth in 2018. Mercedes and BMW each set new all-time highs for worldwide sales for the seventh straight year while Audi had record sales for the eighth consecutive year. There's little evidence to suggest these streaks are at risk, at least from a global perspective. This success should help the three automakers to navigate a more difficult landscape in Europe, where diesel demand is declining, which makes it harder for them to reach tougher emissions goals that start to take full effect in 2021. The trio must also cope with the continued decline in the lucrative UK market, which is set to retreat further because of Britain’s pending exit from the EU. 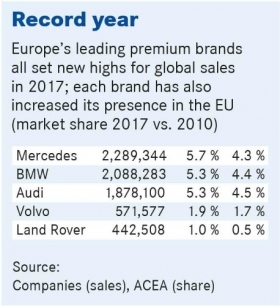 "Premium brands are still a structural growth story since Mercedes, Audi and BMW have been able to considerably expand their product portfolios into volume segments, where they enjoy an image boost compared with mainstream competitors," said Stefan Bratzel, head of the Center of Automotive Management at the University of Applied Sciences in Bergisch Gladbach, Germany. BMW expects its new X7 SUV (shown here as a concept) to lure customers from the Mercedes GLS and Audi Q7. The three automakers also continue to roll out new body styles to add incremental volumes. Hoping to gain ground on global premium sales leader Mercedes, BMW will launch the X2 compact crossover in March. 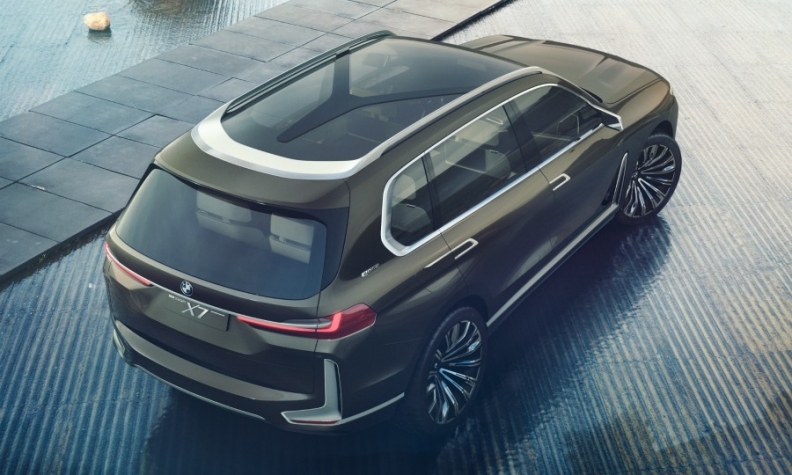 Later this year comes BMW’s stately new X7 SUV that the automaker hopes will lure customers from the Mercedes GLS and Audi Q7. Last month, BMW’s new head of sales, Pieter Nota, expressed confidence that the carmaker had found the right ingredients for further growth. "The increasing availability of BMW’s X models and our continuing model offensive with the introduction of brand new vehicles such as the X2 and the 8 series this year will ensure that BMW can entice more customers to the brand," said Nota, who joined the Bavarian automaker in January from the consumer healthcare division of Dutch conglomerate Philips. Mercedes will try to maintain its product momentum, which has resulted in 58 straight months of record sales. A key arrival this year will be the new A class, which marks the beginning of the automaker's refreshing of its compact family. Models such as the A and B class accounted for more than a quarter of Mercedes' nearly 2.29 million global sales last year. China is the largest market for the A- and B- class models. 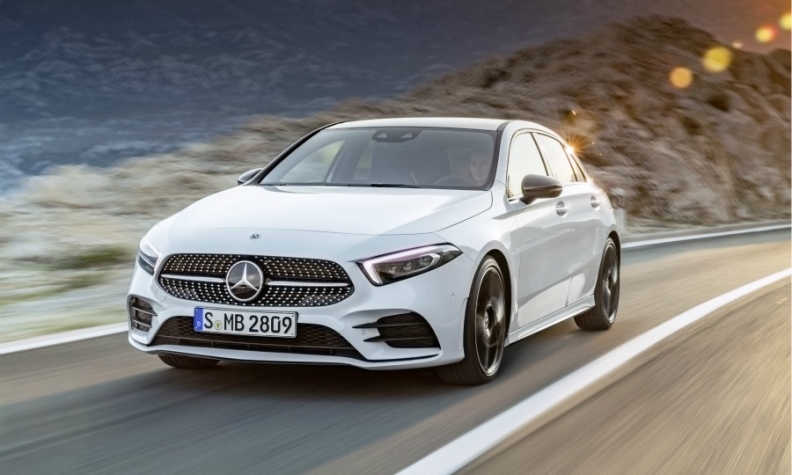 In addition, Mercedes has said it will increase the number of variants offered in its compact range to nine, up from six now. Future variants will include an SUV and a seven-seat model for the B-class family as well as sportier A-class variants, possibly a coupe and a convertible. Daimler will also spend time in 2018 shifting some of its attention to boosting the structural speed and flexibility of its organization to respond faster to the changing landscape. In April, its shareholders will vote whether to approve the creation of two legally independent manufacturing units, one focusing on passenger cars and light commercial vehicles and the other on heavy trucks. Some analysts see this as the prelude to a possible partial listing of the latter. 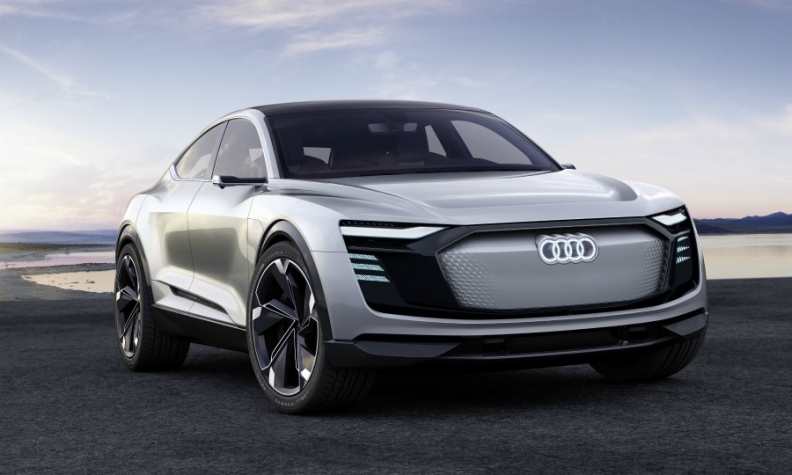 For Audi, this year could prove to be historic with the launch of the e-tron quattro, the first purpose-built electric SUV designed by the Volkswagen Group subsidiary. Arriving a year ahead of a competing model from Mercedes, the EQC, the long-range, electric SUV could be an important indication whether Germany's premium brands can gain true mass-market appeal for their upcoming fleets of battery-powered cars beyond BMW’s modestly selling i3 city car. The sector will also include Mercedes's EQA, which was shown as a concept at last year’s Frankfurt auto show. All of Mercedes’ EV models will be part of its EQ subbrand. Success in the alternative-powertrain sector is critical to reducing premium automakers' carbon footprint ahead of the EU’s 2021 targets as well as helping them comply with a new set of EV quotas in China and more stringent regulations that will follow. Overall, CO2 emissions from new cars in both the UK and Germany increased last year for the first time since records began as consumers shifted from diesels to gasoline-powered engines, which produce more CO2. Demand for diesel could decrease further if a German federal tribunal upholds a lower court ruling that may ban combustion-ignition engines in city centers to combat Europe’s widespread smog problem. "The European CO2 issue is a very serious problem for the German premium brands," Bratzel said. "If the diesel share remains as low as it is currently, carmakers will have enormous difficulty to achieving the [EU carbon emissions] targets."